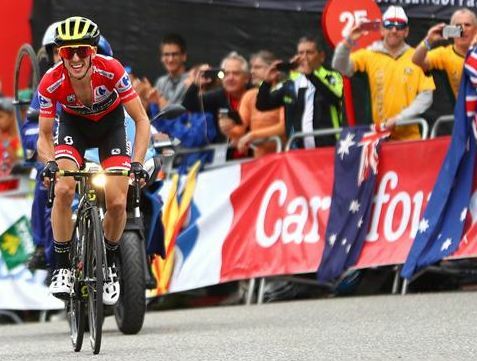 Briton Simon Yates and Australian team Mitchelton-SCOTT are on the verge of creating history at La Vuelta a Espana after the 26-year-old finished third on the penultimate and decisive stage in Andorra to once again extend his lead in the Spanish Grand Tour. With one-minute 46seconds separating him and second place, just a ceremonious stage in Madrid stands between Yates and his first Grand Tour, and the first Australian men’s team to win a Grand Tour in history. With six climbs in just 97km of racing, Mitchelton-SCOTT were prepared for a difficult day defending and they were up to the task. As a non-dangerous break was a couple of minutes ahead, the team still had all eight riders at the front of the bunch as they began the middle climb of Coll de Ordino, despite a heavily reduced peloton. Astana Pro Team were the most aggressive team of the day, putting down the pressure later on the same climb to bring the race back together and leave just the group of favourites to fight it out. Set up by his team, Miguel Angel Lopez (Astana Pro Team) attacked over the second passing of Coll de Beixalis but Adam Yates remained steady to chase him back for brother Simon. The penultimate climb saw more attacks with Lopez once again moving, this time taking Nairo Quintana (Movistar Team) with him. After over 20km on the front in support and just 17km remaining in the stage, Adam Yates told his brother he was on his last legs and Simon Yates immediately attacked, with Enric Mas (Quickstep Floors) in tow, over the top of the penultimate climb to have the upper hand in the valley to the final climb. Yates and Mas quickly bridged to the leading duo of Lopez and Quintana on the descent and the duo joined Lopez in shouldering the work on approach and up the final climb. Quintana dropped back to support teammate Alejandro Valverde before Yates lost contact with the remaining pair just inside seven kilometres to go. As he cleverly paced himself up the challenging Coll de Gallina to finish third on the stage, Yates continued to gain time on the chase group. Mas won the stage to finish second overall with Lopez’s second place also moved him onto the final podium for Madrid. “Adam was running out of legs on the penultimate climb and I didn’t want to be in a position where I was riding through the valley to the final climb, that could have been the worse situation possible. “I knew that Lopez and Quintana were up the road and Lopez especially had something to gain so I knew that he would maybe work with me, so as we say, sometimes attack is best form of defence. “On the last climb I was OK, I was really at my limit and Lopez and Mas they were both incredible in the final and I just tried to ride my own rhythm and that was it. I gave everything that I had and thankfully it was enough.